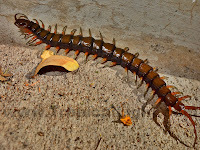 Yep, it is a Centipede. One scary little (actually, not little enough) critter. This one was about six inches long and was scuttling all over the place. When I got close to take this photo, it stopped moving and even smiled for the camera, I think. Thank goodness! I know for a fact that if it had suddenly moved toward me, I would have jumped up and would have started screaming like a little girl. Worse, if the truth be told.